Not only do bestworkwear.co.uk provide one of the largest ranges of workwear for a variety of industries, but we also offer an in-house embroidery & printing service too. See below for full pricing on embroidery and printing, and also some help on using the customisation process during the checkout. If you have a complicated order or would just like us to add the logo's to your order for you, then call our friendly and experienced team on 08454 656665 who will be happy to advise you. You can now add customisations to most items online. You can add simple text in a variety of fonts and colours or you can upload your own logo. You can have the design printed or embroidered, depending on the suitability of the garment - the customisation process will let you know which processes are available on a particular product. You can also see this on a product page - it will show prices for printing and embroidery next to the the plain garment pricing only if that method is available. To get started, add all of the products you require to your basket and proceed to checkout. On the basket page, click the large orange button labelled 'Customise your items'. If you would like to add a logo, click on the 'Upload Logo' tab. If you'd like to add your own text to your garments, select the 'Add Text' tab. Click the text that says 'Click here to select image'. This will open a file explorer window so you can browse to the file on your PC to upload. Select the file and then click the large orange 'Upload your logo' button. This will send the file to the website. You may want to review our artwork guidlines here to see what kind of files we can work with. From the dropdown box below that, choose whether you want the logo to be printed or embroidered. Below that, you will see the products you have in your basket. Click on each one that you want to add the logo to. If the product is 'greyed out' this is because the method you've chosen (print or embroidery) is not available on that particular product, or because the product cannot be decorated by any method. Next, choose the location on the garment where you want the logo to appear. The most popular locations are listed but if you have a more unusual request or want to logo hats, caps, bags, trousers etc just select 'Other' and we will contact you. If you are all done, click on 'Apply Logo and Checkout'. If you want to add another logo, click 'Apply Logo and Add Additional Logo' and repeat the above process for the other logo's required. If you require some standard text adding then click 'Apply logo and Add Text' and read on below for instructions. Make sure you have selected the 'Add text' tab at the top of the customisation page. Click in the text box and type the required text and then click the large orange button labelled 'Add text'. From the dropdown box below that, choose whether you want the logo to be printed or embroidered and select the font and colour of the text. Below that, you will see the products you have in your basket. Click on each one that you want to add the text to. If the product is 'greyed out' this is because the method you've chosen (print or embroidery) is not available on that particular product, or because the product cannot be decorated by any method. Next, choose the location on the garment where you want the text to appear. The most popular locations are listed but if you have a more unusual request or want to logo hats, caps, bags, trousers etc just select 'Other' and we will contact you. If you are all done, click on 'Apply Text and Checkout'. If you want to add more text, click 'Apply Text and Add Additional Text' and repeat the above process for the other text required. If you require a logo adding too click 'Apply Text and Add Logo' and see above for instructions. At the bottom of the customisation page, you will see a Customisation Summary of all logo's / text applied. Click the relevant 'Edit' link to change the customisation or the red X to delete it. Once your basket has customisation applied, there will be an orange 'Edit Customisations' button visible on the basket page that will allow you to jump straight to your customisation summary. Embroidery is priced on the number of stitches in the design. The website will always assume your embroidery to be of 'standard' size which is up to 8000 stitches and charge according to the table below. When we have received your order and artwork, we will calculate the number of stitches in the design and may need to contact you for any additional charge if your logo falls into the 'Large' or 'Extra Large' logo brackets below. Text embroidery will almost always be less than 8000 stitches and so charged as a 'standard' embroidery. There is no setup charge for text in one of our standard fonts - if you need a custom font then this will be treated as a logo embroidery (see below). We will send you a PDF approval page, showing your text exactly as it will embroider and the exact stitch count for you to approve before we proceed. The first stage of embroidering any logo is to convert the image you provide into an embroidery file. This is often known as 'digitising' or 'punching' the logo. This creates a file which tells the embroidery machines where to stitch, what thread to use, the stitch type and the stitch angle. This is a time consuming and skilled process and therefore is subject to a one off setup fee of £9.95 + VAT. This is only charged on the first order, once we have the logo setup it can be used indefinitely on repeat orders without another setup charge. By uploading a logo, you are explicitly telling us that you have have permission to use it - please do not upload copyrighted or other artwork if you do not have the owners permission. When we have digitised your logo, we will send you a PDF approval page, showing your logo exactly as it will embroider and the exact stitch count for you to approve before we proceed. 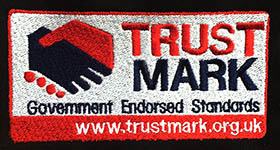 We will also embroider the logo onto a swatch of fabric and scan an image which will also be sent to you for approval. Now we have the accurate stitch count, the logo will be costed as the tables below. The website checkout will only ever charge for a 'standard' size logo (as it cannot know the stitch count), so if your design has more than 8000 stitches we will contact you for any additional amount due. 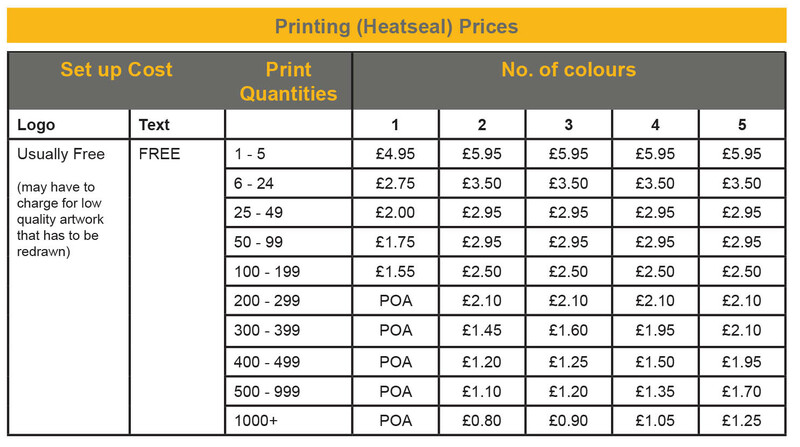 The website will only ever charge based on a 1 colour print, as per the table below. This covers all text printing using a standard font and many single colour logo prints. If your logo has several colours then it will be priced depending on the quantity and number of colours as below. We will contact you for any additional amount due for your logo once we have received your artwork. There is no setup fee on any text printing using a standard font and we will send you a PDF of the design exactly as it will print before proceeding. There is usually no setup fee on logo printing but this can depend on the quality of the artwork you provide. We print from vector artwork and if you can only supply low resolution or poor quality bitmap artwork then there may be a fee to redraw the artwork. This is priced individually based on the amount of work required. In over 95% of cases we can create your print artwork without setup charge, and we will send you a PDF of the design exactly as it will print before proceeding. Our standard schedule to customise items is 5 to 7 working days, plus the leadtime of the plain garment if we do not currently have it in stock. The leadtime of the plain product can be seen on the product page when you choose the colour, and will be displayed in an orange circle under each size of the product. If the leadtime of your plain garment is 1 day, then you should expect to receive your customised items 6 - 8 days after you have approved your artwork. Delivery is very often quicker than this, but it depends on the other amount of work in the queue for that logo method. If you require 'express' delivery then this can often be accomodated, subject to a surcharge. Please contact us with details of the garment, logo and quantity required and we will provide you with a bespoke quotation to meet your requirements. 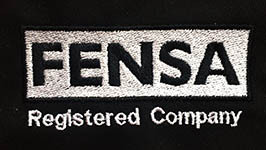 We can add various embroidered and specialist reflective printed designs, without the need for setup charges or costly minimum order quantities. 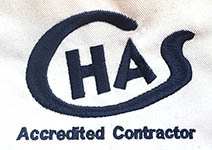 Please note that for 'Approved Contractor' and trade body type logo's we may check that you are listed as an approved member and we reserve right to refuse to embroider the logo if you are not.